Have you registered for SYNC? Have you ever been to SYNC? Are you registered for this year’s conference? If you’ve been in the last few years you know half the magic is the fantastic environment of the Sandestin Golf & Beach Resort where the convention is held. I loved it so much there, I took my wife last Spring and we ended up buying a condo in Baytowne. In fact, we just got back from a post-Christmas vacation! It was strange being on the resort without photographers roaming the streets of Baytowne, but the spirit of SYNC was still there and I couldn’t help sharing so many memories with my wife. There’s the exact spot David Beckham showed me how he lights his seniors outside. This is where I got to see Marci & Christy work a seemingly impromptu and totally fun photo shoot. There’s the pool my roommate Paul and I sat out at, met a group of photographers and talked business for an hour between classes. And this is the restaurant where I had lunch with 4 of my photography heroes and then spilled ketchup all over the front of my shirt. Even still I couldn’t help hearing the voice of Gary Box talking about some new gizmo he was trying out. Or being mesmerized all over again by Sue Bryce’s beautiful presentation and delightful accent. Thinking about all those memories made me realize how important SYNC has become to my growth as a photographer! Every year I come home with a notebook full of ideas – almost too full – but I know even if I implement just one, two or three big ideas I’m WAY ahead of the game. Seriously, the money I spend on SYNC is the best investment in my business and mental attitude I make all year, every year! So what are you waiting for? If you photograph seniors or want to photograph more seniors, you owe it to yourself and your business to check out this year’s SYNC! 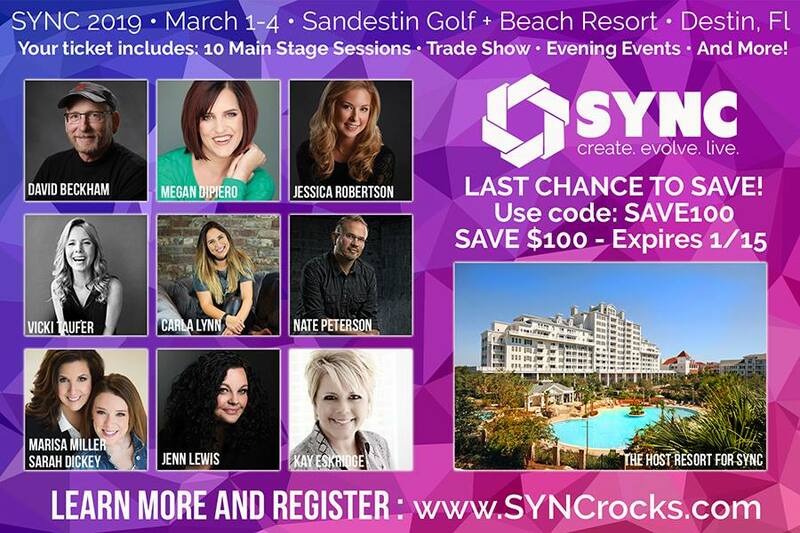 You have until next Tuesday, January 15th to get registered and save $100 by using the code SAVE100 at www.SYNCrocks.com. And to sweeten the pot just a tiny bit, if you register between right now and this Friday, January 11th and send me proof of your registration, I’ll buy you the drink of your choice at Rum Runners (please drink responsibly). Got it? Just register between now and Friday, save $100, get a free drink and stay at one of the coolest resorts in Florida! Come on – that’s what they call a NO BRAINER! GO FOR IT! !